That plastic backyard tub isn’t cutting it. You didn’t pony up the mega bucks to belong to a private swim club this summer. But you really gotta cool off! So we rounded up the best pools that are all clean, have amazing kid features and don’t require memberships. From Glendale to Santa Clarita, these are our favorite places to take the plunge. What’s better than a great pool? Three! The Aquatic Center has a 50 meter competition pool, a 25 meter dive pool and an activity pool complete with water play goodies and a 160 foot water slide. The facility also provides concessions and locker/changing rooms on the landscaped and lighted grounds. With plenty of parking and ample deck space for lounging around, the Aquatic Center has something for everyone, and is worth a drive for the day even if it’s not your local splash spot. The shallow end is shallow enough to let the little kids play without life jackets, and it gradually deepens to the roped off deep end that has two life guards for more proficient swimmers. Keep an eye out for extra events like Dive In movie nights ($10 per person). Right behind the Coliseum is a giant swim stadium with both a competition pool and a shallow wading pool that is easy to navigate with toddlers. We love that you can spend the morning at the California Science Center or Natural History Museum, picnic in the Rose Garden and then splash and swim all afternoon. Note that kids 4 & under are required to wear a swim diaper and kids 6 & under are required to have an adult (one adult per child) with them at all times. Cost: $1 for kids, $3.50 for adults. This clean and welcoming facility does get a little crowded in the summer time because it’s such a great spot to swim. 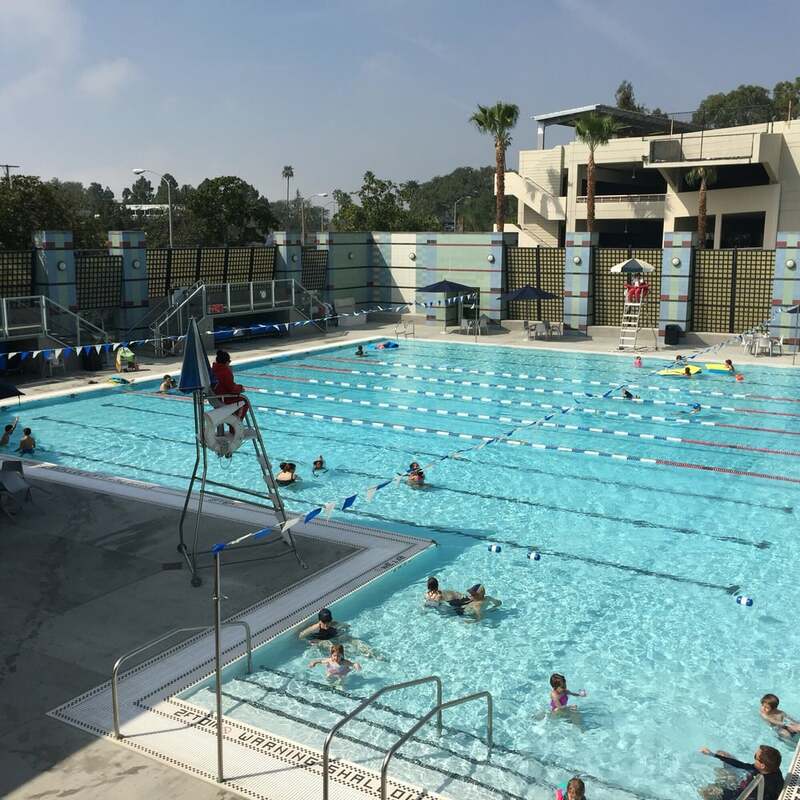 The Santa Monica Swim Center has two heated outdoor pools: one is reserved for classes and lap swim, which means the other is open season for your little fish. There are also several diving boards for your slightly bigger fish. Be sure to check out the pool’s monthly Family Days. The hours for recreational swim shift with the seasons so check the website for updated scheduling information. There are discounted fees for Santa Monica residents, so be sure to bring proof of residency, if that applies. Another great Santa Monica pool is the Stoner Park Pool, which you can learn more about on our list of great splash pads. Cost: For Santa Monica residents it’s $1.50 for kids and $3.50 for adults; for non-residents the rates are doubled. Family and 20-visit passes are also available. This beloved by locals 40,000 square-foot spot boasts both an Olympic size pool, a heated competition pool, and even a diving board, for kids that can pass the swim test and are at least 4 feet tall (those under must be accompanied in the pool by and adult at all times). For all day fun, it’s conveniently located next to a park with a playground, baseball field and basketball courts. Cost: $2.50 for kids and $4 for adults. You can also rent the pool out for parties! Since the SFV is where you really need to keep cool in the summer, it’s lucky that they have this amazing 3-acre venue. It’s two great pools; one specifically for kids with slides and water fountains. There’s a shade structure and grassy spots for when you need a water break. It has two pools. You can also watch the water polo and synchronized swim teams practice! This heated indoor pool is small and impeccably clean. They offer great family swim hours and are open year round. With plenty of elbow room and a wide splash zone, it’s a great spot to expose your first time swimmers to the water. The hours do change seasonally, so check the website for updated information. We love Family Nights on Monday, Wednesday and Friday from 7-9 p.m., where parents who work can still get in a weekday swim with the kids on these long summer nights. Nestled in the middle of the beautiful Rustic Canyon Park, this pool is a little-known gem. Small and well maintained, it is unheated and only open during the summer. A picnic in the park, a dip in the pool, and hike in the woods makes for a perfect summer afternoon. Check website for an up-to-date schedule. Our favorite things about this pool is the amazing shallow end, which is big enough for plenty of not-ready-for-the-Olympics swimmers and the lifeguards. What is it about Glendale, that they have the nicest lifeguards? Also fabulous, is that nearby you have a playground and library, should you want to make a day of it. And if you want to extend that day to night, you’re right near Golden Road Brewery, the single most kid friendly spot to grab a beer in town. Cheers to summer beers! Recreation swim hours are typically in the afternoon, but check the website the day you plan to go, as they can change. Cost: It’s $.50 for kids and $3 for adults; you can also buy 15-visit ($6-$36) or unlimited visit ($20-$75) passes for the summer. It’s always hot in the valley, and the Hubert H. Humphrey pool is adjacent to the park with a children’s play area, picnic tables and basketball courts, so you’ll always be ready to dive in here. Plus the pool is open year round, and there’s a water slide! Check the website for summer hours. Open year round, the Rosebowl Aquatics is a beautiful facility. With family swim evenings and summer camps there is much more to do here than just taking a splash. Kids love to watch the divers and water polo teams practice or play at the fantastic pirate themed park right behind the pools when they’re tired of swimming. The hours for recreational and family swim change seasonally, so check the website for a current schedule. Kids under 8 must be accompanied by an adults in the pool with a 1:1 ratio, so don’t plan on bringing a carload of new swimmers here solo! Cost: Kids are $1, adults are $2. The Beach House pool is one of the few remaining features from the original Marion Davies estate. Your family is sure to soak up some sunshine and old Hollywood glamor at this beautiful beach side spot. Those under 8 must be accompanied in the water by an adult at all times, so if you are hoping to lounge poolside like a 1920’s starlet, bring along another grownup. Hours change seasonally, and passes sell out quickly, so check out the website for advance passes and reservations (you can even reserve a parking spot) before planning your visit. You can also get food by the pool, play on the playground, stroll the beach and splash in the pad. (These are the cleanest public pool bathrooms we’ve yet to see, and that alone lands it on our list!) Note that this pool has no shallow end, so it’s not a spot where tiny tots can splash and play alone. Cost: $4 per kid, $10 per adult. Parking is $12 for the day. Mondays in the summer are Half Off Admission days and no reservations are available. Insider’s Tip: All Los Angeles County pools require that an adult accompany any kids under 7 on a one-to-one ratio, so be sure to grab one grown-up per munchkin. Also, many city run pools offer a discount with a city library card, so double check your pockets before heading out. Most LA County pools are open by June 10, 2017; all are open by June 17. Call for hours and open dates at your local pool! Dive in to these all natural swimming holes. Play in the water without swimming at these splash pads. Spend the day at at family friendly beach. Splash through a fountain in the middle of the city. Where will your toes be dipping this summer?